As shown below the versatility of NOXiDE is evident with a direct application to existing super six asbestos roof substrate. Aged asbestos roofs (Super 6) are continuing to deteriorate and are a cause for concern for the health and safety of the community. 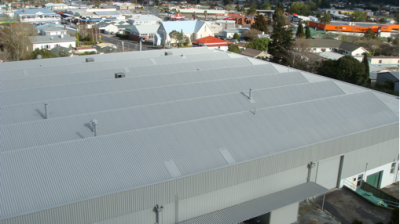 Asbestos cement (fibre) roofs have been a high performing product and there are many roofs around New Zealand that are into their fourth or fifth decade of service, without anything ever have being done on them in regards to maintenance. However, asbestos roofing undergoes a weathering process after many years of exposure and a loose surface layer develops which becomes colonised with lichen. The lichen, secretes oxalic acid and attacks the cement, causing exposure of the asbestos fibre. The surface becomes unstable, the asbestos roofing is weakened and the darkened colour causes a substantial increase in roof cavity temperatures. 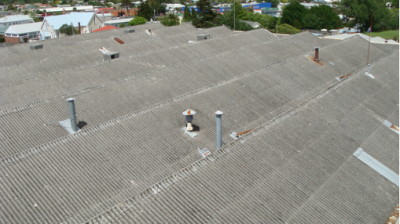 In the 1980’s the use of asbestos was discontinued in the production of fibre reinforced cement sheeting, but the existing roofs continue to age and deteriorate. By having your asbestos roof encapsulated before it becomes friable can extend out the life of your roof for a further decade and save you a costly reroof. Just the disposal alone of the asbestos roofing is expensive. ROOFING & WATERPROOFING LTD are able to travel nationwide to encapsulate your asbestos roof or cladding!